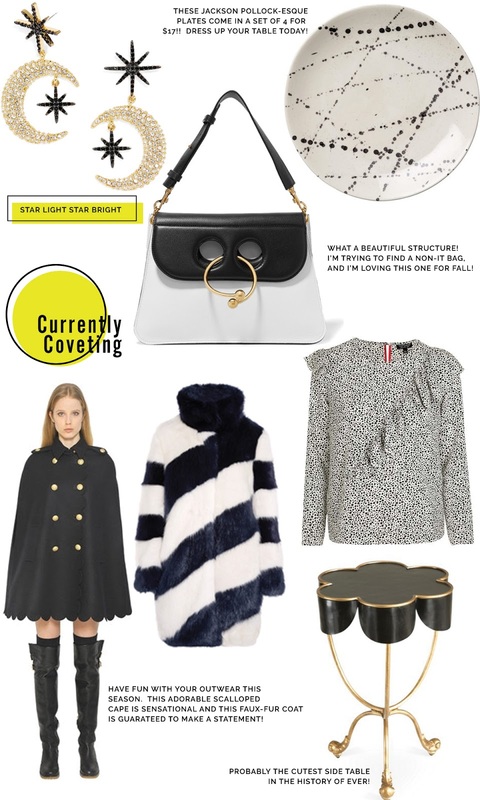 A few things I'm currently coveting....and for some reason they are all black and white. I guess my latest table setting rubbed off on me. These fun earrings are fun and elegant all in one, and only $38! I am totally in love with these splatter plate salad dishes. And no, I cannot believe they are $17 for a set of 4. That seems like a great deal, and they would look amazing with my new tea towels and striped placemats. I want to find a bag that is an anti-it bag...know what I mean? I want it to be beautiful and under the radar, so no one knows who it's by. I'm tired of everyone carrying the same bags lately. Where did originality go? I love the structure, design and size of this one. This cape has me swooning ever since I spotted it a few weeks ago. It is so darn cute! And I love a good faux-fur. I have a couple and you feel so dramatic in them. This black and white one is sure to make you feel on top of the world. I can't stay away from ruffles. Dress this black and white top with cropped pants and booties for that perfect fall look. And can we please all talk about this adorable side table?!! Too cute for words!